Well, I recently had a nostalgia overload while going through some old files here at Discover Lehigh Valley and finding some interesting things, which are worth sharing. Allentown, Bethlehem, and Easton in the Lehigh Valley are conveniently located in southeast Pennsylvania. Rich in history and tradition, the Lehigh Valley is filled with exciting activities and attractions; extraordinary accommodation facilities; and warm, friendly people. There are Bach, balloon, and shad festivals; fairs; art and craft shows; excursions; canal boat rides; a new Wildwater Kingdom; antique auto shows; a Musikfest celebration; international bicycle racing; factory outlets; quaint shops; and unique museums. There’s such a diversity of things to see, explore, and enjoy – one visit won’t be enough. 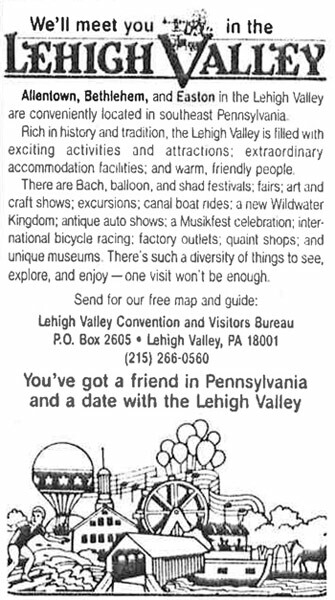 You’ve got a friend in Pennsylvania and a date with the Lehigh Valley. This ad is interesting for many, many reasons, some nostalgic, some just interesting. The first two lines are as accurate today as they were in 1986. The third line/paragraph is where the nostalgia begins. 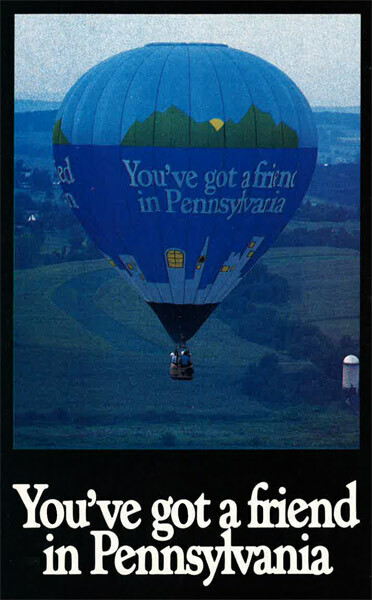 We still have a Bach Festival put on by The Bach Choir of Bethlehem, but the last balloon festival was over 20 years ago. We still have fairs, art and craft shows, excursions and canal boat rides. The “new Wildwater Kingdom” which was new at that time, had just opened the year before in 1985. We are still well known for our antique auto shows like Das Awkscht Fescht and Wheels of Time Rod & Custom Jamboree, and we still have international bicycle racing at what was then the Lehigh Valley Velodrome, which is now the Valley Preferred Cycling Center. Musikfest is no longer just a celebration. It’s more than an event too. It is practically a local holiday that we share with people from all around the world, and that’s good because we’ve been touting it since 1986. Additionally in 1987, Musikfest was named one of the Top 100 Events in North America by Destinations magazine. We still have shopping, factory outlets and quaint shops; in fact we probably have more now than we did then. And, our wonderful museums are still abundant and wonderful ways to spend an afternoon. 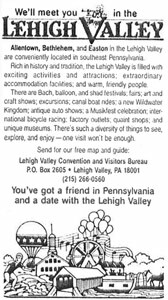 Our name is no longer “Lehigh Valley Convention and Visitors Bureau,” but we still do all the things we used to and more. But, the last line is something that isn’t as prevalent as it used to be. Now, before I continue, we don’t use “the” anymore in front of Lehigh Valley. It’s just "Lehigh Valley" not "the Lehigh Valley," which was not done to copy TheFacebook’s change to Facebook. If you don’t remember that change, you either signed up after 2005 or didn’t watch The Social Network. Either way, our “the” dropping was unrelated. Why did we drop “the?” It’s the difference between a construct and a place. "The West Coast" is a construct, while Napa Valley is a place, very much like Lehigh Valley. You wouldn’t say "the Napa Valley," so why would you say "the Lehigh Valley?" That’s why we dropped “the,” because Lehigh Valley is not a construct, it is an actual factual place and we’re proud to live, play, work and promote the region. By living, working, and promoting Lehigh Valley as we do, one thing still remains as true today as when it was written in that ad, "one visit won’t be enough." It is not just that "there’s such a diversity of things to see, explore, and enjoy," it is also that there is such a quantity of diverse and quality things to do, you cannot possibly do it all in one afternoon, or one day, or even one week. That&apos;s the beauty of our region, the wonder of Lehigh Valley. Whether you&apos;re visiting for your first, 10th, or 100th time, or if you&apos;ve lived here all your life, there will always be something new you can discover in Lehigh Valley.